Lil Country Librarian: How did I survive Book Fairs without this? How did I survive Book Fairs without this? This is seriously my most favorite purchase so far this year! 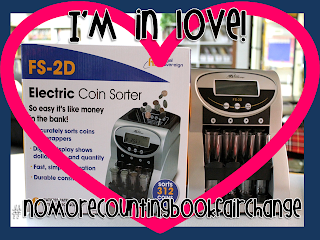 It's the Royal Sovereign Electric Coin Sorter and it counts change, too! Anyone who has had to count bags upon bags of change for the Book Fair will know exactly what I'm talking about! This is amazing!!! I can't wait to put it to good use at our Fall Book Fair in September. What is your favorite item that helps simplify your Book Fair? OH, my goodness!! That is a brilliant idea!! My favorite item at the book fair was always my teaching aide! Ok - she was a person, and a wonderful one at that! I don't think I could have done book fair without her!